Anthony B. Kirkland is Assistant Professor of Trumpet at Mississippi State University. His duties include teaching applied trumpet, trumpet consort, and performing as principal trumpet in the Golden Triangle Brass Quintet and the MSU-Starkville Symphony. He completed a 20-year career in The United States Air Force Band’s Ceremonial Brass in Washington, D.C., in 2007, where he performed often at the White House, Constitution Hall, Arlington National Cemetery, and Embassy Row. He has also performed with the Annapolis Symphony, Arlington Virginia Symphony, The Mississippi Symphony, The Louisiana Philharmonic and the Memphis chamber ensemble Prizm. Anthony has performed across the United States and internationally in Norway, Sweden, Holland, Russia, and Italy. 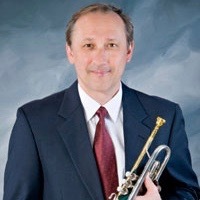 He holds a Bachelor of Music Education from Troy University, a Master of Music from the Florida State University, and a Doctorate in Trumpet Performance from the University of Maryland. His teachers include Bryan Goff, Philip Collins, Emerson Head, and Chris Gekker. He has published articles in the International Trumpet Guild Journal, The Instrumentalist, Bandworld, and The Brass Herald. Dr. Kirkland’s book, Wind Band Excerpts for Trumpet and Cornet, was published by Balquhidder Music in 2016.